The new $223 million LINQ Hotel and Promenade will Incorporate The LINQ promenade and the High Roller Observation Wheel to create iconic center Strip social hub. Caesars Entertainment recently announced its newest property, unveiling The LINQ Hotel and Casino as the latest addition to its portfolio of iconic Las Vegas resorts. 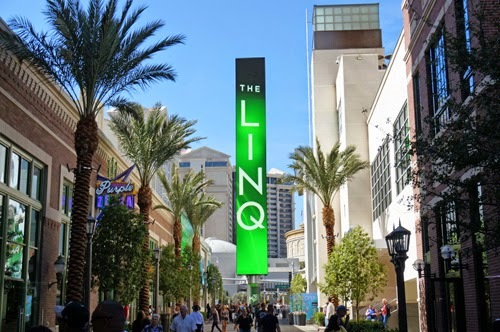 Located at the heart of Center Strip at 3535 Las Vegas Boulevard, the LINQ Hotel and Promenade is a complete re-imagination of the current Quad Resort and Casino. The Linq Hotel and Promenade will feature 2,256 brand new rooms and suites, a completely renovated welcome experience renovating the lobby area to include a swank, signature bar, spa and retail shops, as well as a new pool deck set to open in Spring 2015. The Guy Fieri Vegas Kitchen and Bar will stay put, as will Hash House a Go Go, TAG Lounge and Purple Zebra, Daiquiri Bar. Combined with the world’s largest observation wheel, the High Roller, and The LINQ retail, dining and entertainment promenade, The LINQ Hotel and Promenade is set to become the new social center of Las Vegas and will welcome its first guests beginning on Oct. 30, 2014.